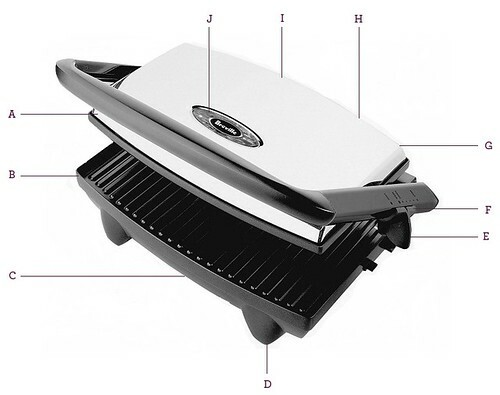 The Breville® SG630XL, Ribbed 2~in~1 Panini Press™ – Some sandwiches are just better toasted, and with the Ribbed 2~in~1 Panini Press, you can do just that and have the grill marks to prove it. Italian style sandwiches and snacks in just minutes. A. 1500W Concealed Element. B. Non-Stick Ribbed Cooking Plates. C. Cord Storage. D. Non-Skid Feet. E. Adjustable Height Control. F. Storage Lock for Locking the Plates Closed for Storing. G. Chrome Housing. 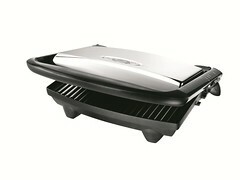 H. Floating Top Plate. I. Concealed Hinge. J. Warm Up' and 'Ready' Lights.